I'll admit it. I'm an indifferent gardener. Bending over for hours at a time is difficult for most people, it's doubly different when you are taller than about 90 percent or more than the rest of the population. So it's going to be done regardless of lazy grumbling or knees or something else that you can't quite put your fingers at. Eventually that collection of rocks in front of the house that defines a parking space gets filled with random weeds that demands attention. Seeds get caught on the winds from the neighbor's yard on the East side and land there. They'll take root and you'll have to deal with them. It is usually the East side since there's a constant breeze coming from that side. If the winds shift, duck and cover, Mom, there's a storm's a comin'! As a chore, it's not my favorite. That Florida Sun that you folks come down here for in February is a lot more intense in August. While it's cooler here on average than in the big cities of the Northeast in the summer, it's not by much. About three times a year, or more, it gets to the point where it's time for Chemical Warfare. Fill a spray bottle with a toxic syrup and water mix, pump it full of air to pressurize it, and pollute the water table for the next generation to get rid of those weeds. RoundUp. Kills weeds, and we're not really sure how long it remains in the environment, are we? I've come to terms with these weeds. They pop up in the middle of the lawn, and under the hedges. I'll usually take some time to go after them on twice weekly trash day, early in the morning. Well it's early for you, I'm up an hour before sunrise anyway, may as well make it productive, right? A good trash day is defined by how many trips I make it back to the trash cans. Pull the weeds starting at the can on the swale, and work outwards. That means that those areas in the back get the weedeater treatment. Now mind you a weedeater can be a fun piece of equipment to use. If you can get it started, that is. Mine takes about a solid half hour of pulling on a cord to get the thing to start. Tune-up you say? Probably. Once it's started, a snarling two-cycle motor sputters to life. Churning through the weeds that have grown thickly under the Jasmine hedges and under the bottoms of the large fruit plant pots in the back yard, I'll attack. By this time all sorts of critters that belong there, lizards, snakes, and frogs, have headed elsewhere. My dog inside the house has retreated to a cozy corner to hide from the din, and flocks of birds have launched noisily to get away from the madness. There's irrigation lines down there. Stop what you're doing. Time to unwind the rubber tube from the bottom of the weed eater's string head. The machine is stopped anyway, wrapping itself in a double helix of water delivery. Mutter a few words at the appliance and your own forgetfulness since you could have picked that water line up couldn't you? It's about now that your friends come to visit. Insects stirred up from the noise and vibration of the harvesting of the weeds are rising to greet you. Your pet Mosquitoes have come by for a meal at the diner of you. It's easier to just walk around the yard while you're trying to get the weedeater started again. At least it's warmed up. But eventually it's all done and settled. 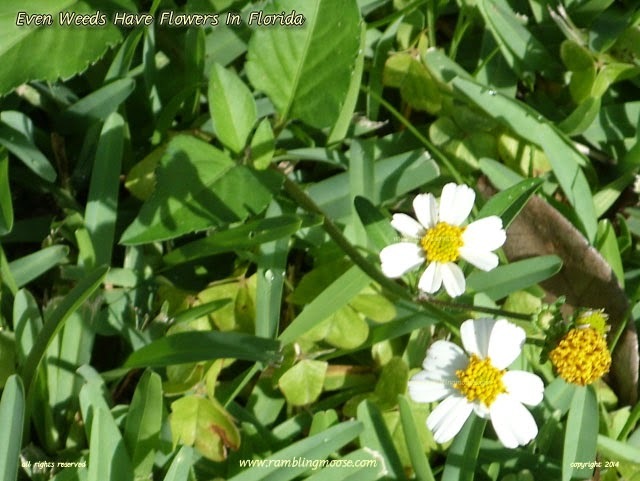 There's just one last white flower with a yellow head in the middle. Pull those gently. There's a root on those that looks like one of those thick ginger roots you see at the supermarket and can't quite figure how much of that to add to your meal to give it a little extra tang. If the root snaps off, you'll have flowers back in a month. One month later, it's time to get the weedeater out. Start over again. After all, it's trash day isn't it? What's a little weeding between friends? It's the cycle of gardening. You pull, we'll make more!